Input tags and values to produce a Dorling Map (i.e. bubbles). Output is an svg. Login with your Issue Crawler username. Input tags (or phrases) and their values to produce a Dorling Map (i.e. bubble graphs). The output is an svg file. Example: Wikipedia Bots project. 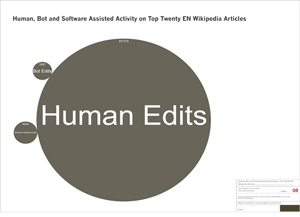 This dorling map shows the shares of human edits, bot edits and tools-assisted human edits in the top twenty English language Wikipedia articles. write down the ID of the Dorling map you want on the right-hand side. Add &map2=## to the url, where ## is the ID number, and press enter. Example: Climate Change Skeptics project. 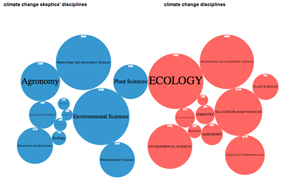 Comparing Climate change science disciplines to climate change skeptics' disciplines. A bubble graph is a powerful visualization tool, and could be an alternative to a tag cloud. 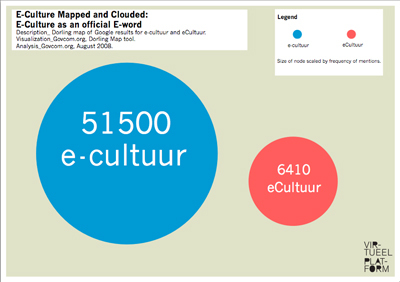 In the sample project E-Culture Mapped and Clouded, the Dorling tool was used to map the Google search results for the query e-cultuur, as well as for the query eCultuur. The results indicate that e-culture is now a recognized 'e-word', according to Google results.